With more and more players developing online tournament skills, winning one isn't as easy as it used to be. But an Intertops Poker player that won his way to the Caribbean Poker Tour in St Maartens by winning an online satellite thinks he'll do well in the live tournament if he plays the way he does online. Two winners of Caribbean Poker Tour satellites hosted by Juicy Stakes Poker and Intertops Poker will be going to St Maartens next month. Chris P aka “Grandma Mary” won his $2700 prize package in an online satellite in August. “Sim79” from Quebec, Canada just won his trip last Sunday. 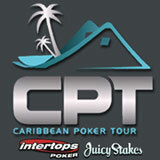 The Caribbean Poker Tour Main Event (buy in $1000 + $100), November 1-2, will bring poker players from around the world together a few days before the WPT Caribbean Tournament. Schedule of CPT satellites and main events.